This article is about the contemporary Nile Valley ethnic group. For other uses, see Egyptian (disambiguation). Egyptians (Egyptian Arabic: مَصريين‎ IPA: [mɑsˤɾɪjˈjiːn]; Maṣreyyīn; Arabic: مِصريّون‎; Coptic: ⲛⲓⲣⲉⲙⲛ̀ⲭⲏⲙⲓ Ni/rem/en/kīmi) are an ethnic group native to Egypt and the citizens of that country sharing a common culture and a common dialect known as Egyptian Arabic. Egyptian identity is closely tied to geography. 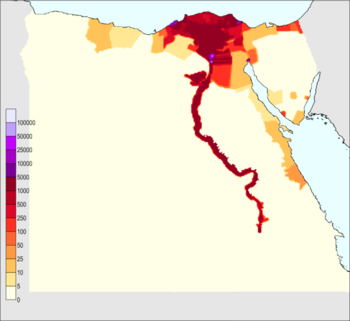 The population of Egypt is concentrated in the lower Nile Valley, the small strip of cultivable land stretching from the First Cataract to the Mediterranean and enclosed by desert both to the east and to the west. This unique geography has been the basis of the development of Egyptian society since antiquity. The daily language of the Egyptians is the local variety of Arabic, known as Egyptian Arabic or Masri. Additionally, a sizable minority of Egyptians living in Upper Egypt speak Sa'idi Arabic. Egyptians are predominantly adherents of Sunni Islam with a Shia minority and a significant proportion who follow native Sufi orders. A considerable percentage of Egyptians are Coptic Christians who belong to the Coptic Orthodox Church, whose liturgical language, Coptic, is the most recent stage of the ancient Egyptian language and is still used in prayers along with Egyptian Arabic. Copts (قبط, qibṭ, qubṭ), also a derivative of the Greek word Αἰγύπτιος, Aiguptios ("Egypt, Egyptian"), that appeared under Muslim rule that overtooked the Roman rule in Egypt, to refer to the Egyptian locals and to separate them from the Arabs rulers. Coptic was the language of the state, Church and people  but then got replaced by Arabic after the Muslim conquest, Islam became the dominant religion centuries after the Muslim conquest in Egypt mostly due to centuries of conversion from Christianity to Islam due to the higher rate of tax on Christians despite a tax all Egyptians had to pay, the modern term then became exclusively associated with Egyptian Christianity and Coptic Christians who are members of the Coptic Orthodox Church or Coptic Catholic Church, though references to native Muslims as Copts are attested until the Mamluk period. Masryeen (Masryyeen), the modern Egyptian name, which comes from the ancient Semitic name for Egypt and originally connoted "civilization" or "metropolis". Classical Arabic Miṣr (Egyptian Arabic Maṣr) is directly cognate with the Biblical Hebrew Mitsráyīm, meaning "the two straits", a reference to the predynastic separation of Upper and Lower Egypt. 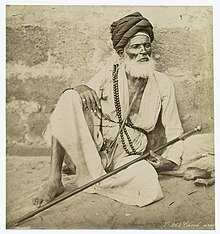 Edward William Lane writing in the 1820s, said that Egyptians commonly called themselves El-Maṣreyyīn 'the Egyptians', Ewlad Maṣr 'the Children of Egypt' and Ahl Maṣr 'the People of Egypt'. He added that the Turks "stigmatized" the Egyptians with the name Ahl-Far'ūn or the 'People of the Pharaoh'. 𓂋𓍿𓀂𓁐𓏥𓈖𓆎𓅓𓏏𓊖 / rmṯ n Km.t, the native Egyptian name of the people of the Nile Valley, literally 'People of Kemet' (i.e., Egypt). In antiquity, it was often shortened to simply Rmṯ or "the people". The name is vocalized as rem/en/kī/mi ⲣⲉⲙⲛ̀ⲭⲏⲙⲓ in the (Bohairic) Coptic stage of the language, meaning "Egyptian" (ni/rem/en/kīmi ⲛⲓⲣⲉⲙⲛ̀ⲭⲏⲙⲓ with the plural definite article, "the Egyptians"). There are an estimated 92.1 million Egyptians. Most are native to Egypt, where Egyptians constitute around 91% of the population. Approximately 84–90% of the population of Egypt are Muslim adherents and 10–15% are Christian adherents (10–15% Coptic, 1% other Christian) according to estimates. The majority live near the banks of the Nile River where the only arable land is found. Close to half of the Egyptian people today are urban; most of the rest are fellahin that are native, along with descendants of several Arab tribes living in rural towns and villages. A large influx of fellahin into urban cities, and rapid urbanization of many rural areas since the early 20th century, have shifted the balance between the number of urban and rural citizens. Egyptians also form smaller minorities in neighboring countries, North America, Europe and Australia. Egyptians also tend to be provincial, meaning their attachment extends not only to Egypt but to the specific provinces, towns and villages from which they hail. Therefore, return migrants, such as temporary workers abroad, come back to their region of origin in Egypt. According to the International Organization for Migration, an estimated 2.7 million Egyptians live abroad and contribute actively to the development of their country through remittances (US$7.8 billion in 2009), circulation of human and social capital, as well as investment. Approximately 70% of Egyptian migrants live in Arab countries (923,600 in Saudi Arabia, 332,600 in Libya, 226,850 in Jordan, 190,550 in Kuwait with the rest elsewhere in the region) and the remaining 30% are living mostly in Europe and North America (318,000 in the United States, 110,000 in Canada and 90,000 in Italy). Their characteristic rootedness as Egyptians, commonly explained as the result of centuries as a farming people clinging to the banks of the Nile, is reflected in sights, sounds and atmosphere that are meaningful to all Egyptians. Dominating the intangible pull of Egypt is the ever present Nile, which is more than a constant backdrop. Its varying colors and changing water levels signal the coming and going of the Nile flood that sets the rhythm of farming in a rainless country and holds the attention of all Egyptians. No Egyptian is ever far from his river and, except for the Alexandrines whose personality is split by looking outward toward the Mediterranean, the Egyptians are a hinterland people with little appetite for travel, even inside their own country. They glorify their national dishes, including the variety of concoctions surrounding the simple bean. Most of all, they have a sense of all-encompassing familiarity at home and a sense of alienation when abroad ... There is something particularly excruciating about Egyptian nostalgia for Egypt: it is sometimes outlandish, but the attachment flows through all Egyptians, as the Nile through Egypt. Egyptian emigration today is motivated by even higher rates of unemployment, population growth and increasing prices. Political repression and human rights violations by Egypt's ruling régime are other contributing factors (see Egypt § Human rights). Egyptians have also been impacted by the wars between Egypt and Israel, particularly after the Six-Day War in 1967, when migration rates began to rise. In August 2006, Egyptians made headlines when 11 students from Mansoura University failed to show up at their American host institutions for a cultural exchange program in the hope of finding employment. The Egyptians for their part object to what they call the "Saudization" of their culture due to Saudi Arabian petrodollar-flush investment in the Egyptian entertainment industry. Twice Libya was on the brink of war with Egypt due to mistreatment of Egyptian workers and after the signing of the peace treaty with Israel. When the Gulf War ended, Egyptian workers in Iraq were subjected to harsh measures and expulsion by the Iraqi government and to violent attacks by Iraqis returning from the war to fill the workforce. "Pharaonism" rose to political prominence in the 1920s and 1930s during the British occupation, as Egypt developed separately from the Arab world. A segment of the most Westernized upper class argued that Egypt was part of a Mediterranean civilization. This ideology largely developed out of the country's lengthy pre-Islamic pre-Arab history, the relative isolation of the Nile Valley and the mostly homogeneous indigenous non-Arab genetic ancestry/ethnicity of the inhabitants, regardless of current religious identity. One of Pharaonism's most notable advocates was Taha Hussein who remarked "Pharaonism is deeply rooted in the spirits of the Egyptians. It will remain so, and it must continue and become stronger. The Egyptian is Pharaonic before being Arab." The Egyptians are not Arabs, and both they and the Arabs are aware of this fact. They are Arabic-speaking, and they are [predominantly] Muslim[. I]ndeed [the Muslim] religion plays a greater part in their lives than it does in those either of the [Muslim] Syrians or the Iraqi [Muslims]. 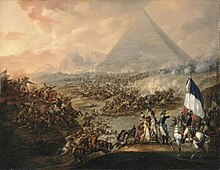 But the Egyptian, during the first thirty years of the [twentieth] century, was not aware of any particular bond with the Arab East... Egypt sees in the Arab cause a worthy object of real and active sympathy and, at the same time, a great and proper opportunity for the exercise of leadership, as well as for the enjoyment of its fruits. But [Egypt,] she is still Egyptian first and Arab only in consequence, and her main interests are still domestic. Many Egyptians today feel that Egyptian and Arab identities are inextricably linked, and emphasize the central role that Egypt plays in the Arab world. Others continue to believe that Egypt and Egyptians are simply not Arab, emphasizing indigenous Egyptian heritage, culture and independent polity, pointing to the perceived failures of Arab and pan-Arab nationalist policies. Egyptian anthropologist Laila el-Hamamsy illustrates the modern-day relationship between the two trends, stating: "in light of their history, Egyptians ... should be conscious of their national identity and consider themselves, above all, Egyptians. How is the Egyptian, with this strong sense of Egyptian identity, able to look himself as an Arab too?" Her explanation is that Egyptianization translated as Arabization with the result being "an increased tempo of Arabization, for facility in the Arabic language opened the windows into the rich legacy of Arabic culture. ... Thus in seeking a cultural identity, Egypt has revived its Arab cultural heritage." Historically, Egyptians have considered themselves as distinct from 'Arabs' and even at present rarely do they make that identification in casual contexts; il-'arab [the Arabs] as used by Egyptians refers mainly to the inhabitants of the Gulf states... Egypt has been both a leader of pan-Arabism and a site of intense resentment towards that ideology. Egyptians had to be made, often forcefully, into "Arabs" [during the Nasser era] because they did not historically identify themselves as such. Egypt was self-consciously a nation not only before pan-Arabism but also before becoming a colony of the British Empire. Its territorial continuity since ancient times, its unique history as exemplified in its pharaonic past and later on its Coptic language and culture, had already made Egypt into a nation for centuries. Egyptians saw themselves, their history, culture and language as specifically Egyptian and not "Arab." In the Early Dynastic Period, Egyptians spoke the Archaic Egyptian language. 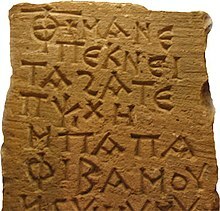 In antiquity, Egyptians spoke the Egyptian language. It constitutes its own branch of the Afroasiatic family. The Coptic language is the direct descendant of the Egyptian language, written in Coptic alphabet. Arabic was adopted by the rulers of Egypt after the Arab invasion and gradually came to replace Coptic as the spoken language. Spoken Coptic was mostly extinct by the 17th century but may have survived in isolated pockets in Upper Egypt as late as the 19th century. The official language of Egypt today is Arabic. The spoken vernacular is known as Egyptian Arabic, while Modern Standard Arabic is reserved for more formal contexts as is the case in all Arab countries. While a huge majority of the Egyptian Arabic dialect is derived from the formal Arabic language, it has also been highly influenced by many other languages such as French, Turkish and the old Egyptian language. This is widely thought to be the effects of being the victim of several invasions, including that of the Ottoman Empire as well as the French invasion. As each nation came and went, the Egyptians kept the few words and phrases that made the language seem easier. Originally the Egyptians wrote in hieroglyphics. At first the meaning of the hieroglyphics was unknown; until one day in the year 1799 Napoleón Bonaparte's soldiers dug up the Rosetta stone. The Rosetta Stone was found broken and incomplete. It features 14 lines of hieroglyphic script, 32 lines in Demotic and 53 lines of Ancient Greek. Ancient Egypt saw a succession of thirty dynasties spanning three millennia. During this period, Egyptian culture underwent significant development in terms of religion, arts, language and customs. Egypt fell under Hyksos rule in the Middle Bronze Age. The native nobility managed to expel the conquerors by the Late Bronze Age, thereby initiating the New Kingdom. During this period, the Egyptian civilization rose to the status of an empire under Pharaoh Thutmose III of the 18th dynasty. It remained a super-regional power throughout the Amarna Period as well as during the 19th and 20th dynasties (the Ramesside Period), lasting into the Early Iron Age. Throughout the Pharaonic epoch (viz., from 2920 BC to 525 BC in conventional Egyptian chronology), divine kingship was the glue which held Egyptian society together. It was especially pronounced in the Old Kingdom and Middle Kingdom and continued until the Roman conquest. The societal structure created by this system of government remained virtually unchanged up to modern times. The cult of Isis, like those of Osiris and Serapis, had been popular in Egypt and throughout the Roman Empire at the coming of Christianity, and continued to be the main competitor with Christianity in its early years. 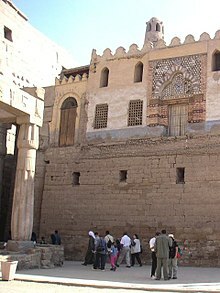 The main temple of Isis remained a major center of worship in Egypt until the reign of the Byzantine emperor Justinian I in the 6th century, when it was finally closed down. Egyptians, disaffected and weary after a series of foreign occupations, identified the story of the mother-goddess Isis protecting her child Horus with that of the Virgin Mary and her son Jesus escaping the emperor Herod. The new Muslim rulers moved the capital to Fustat and, through the 7th century, retained the existing Byzantine administrative structure with Greek as its language. Native Egyptians filled administrative ranks and continued to worship freely so long as they paid the jizya poll tax, in addition to a land tax that all Egyptians irrespective of religion also had to pay. The authority of the Miaphysite doctrine of the Coptic Church was for the first time nationally recognized. Dhul-Nun was regarded as the Patron Saint of the Physicians and is credited with having introduced the concept of Gnosis into Islam, as well as of being able to decipher a number of hieroglyphic characters due to his knowledge of Coptic. He was keenly interested in ancient Egyptian sciences, and claimed to have received his knowledge of alchemy from Egyptian sources. Egyptians continued to live socially and politically separate from their foreign conquerors, but their rulers like the Ptolemies before them were able to stabilize the country and bring renewed economic prosperity. It was under the Shiite Fatimids from the 10th to the 12th centuries that Muslim Egyptian institutions began to take form along with the Egyptian dialect of Arabic, which was to eventually slowly supplant native Egyptian or Coptic as the spoken language. 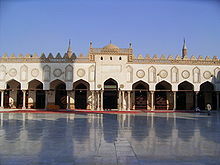 The Mamluks of Egypt (AD 1258–1517) as a whole were, some of the most enlightened rulers of Egypt, not only in the arts and in providing for the welfare of their subjects, but also in many other ways, such as efficient organisation of law and order and postal services, and the building of canals, roads, bridges and aqueducts. Though turbulent, often treacherous and brutal in their feuds, and politically and economically inept, the later Mameluks maintained the splendour and artistic traditions of their predecessors. 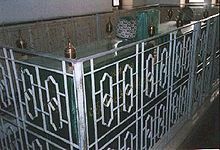 The reign of Kait Bey (1468-1496) was one of high achievement in architecture, showing great refinement of taste in the building of elegant tombs, mosques and palaces. It was a period in which learning flourished. Ultimately, Mamluk rule rested on force. The chronicles of the period are replete with examples of Mamluk violence against the indigenous population of Egypt...From horseback, they simply terrorized those lesser breeds who crossed their paths. The sudden and arbitrary use of force by the government and its dominant military elite; frequent resort to cruelty to make a point; ingenious methods of torture employed both for exemplary purpose and to extract wealth from others: all these measures were routine in the Mamluk era. Egypt under the Mamluks was not a very secure place to live. From the Egyptian side, literary works from both the Mamluk and Ottoman eras indicate that literate Egyptians had not totally submerged their identity within Islam, but retained an awareness of Egypt's distinctiveness as a uniquely fertile region of the Muslim world, as a land of great historical antiquity and splendor... At least for some Egyptians, 'the land of Egypt' (al-diyar al-misriyya) was an identifiable and emotionally meaningful entity within the larger Muslim polity of which it was now a province. The period between 1860–1940 was characterized by an Egyptian nahda, renaissance or rebirth. 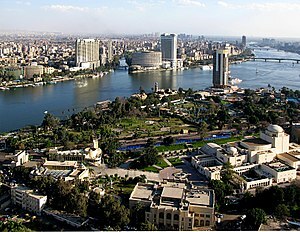 It is best known for the renewed interest in Egyptian antiquity and the cultural achievements that were inspired by it. Along with this interest came an indigenous, Egypt-centered orientation, particularly among the Egyptian intelligentsia that would affect Egypt's autonomous development as a sovereign and independent nation-state. 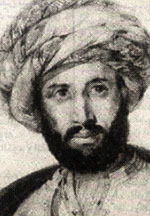 Mustafa Kamil (1874−1908), an anti-colonial nationalist famous for coining the phrase, "If I had not been an Egyptian, I would have wished to become one". 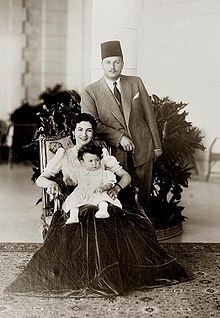 King Farouk I, Queen Farida and their first-born daughter Princess Ferial c. 1940. Egypt is not just a piece of land. Egypt is the inventor of civilisation ... The strange thing is that this country of great history and unsurpassed civilisation is nothing but a thin strip along the banks of the Nile ... This thin strip of land created moral values, launched the concept of monotheism, developed arts, invented science and gave the world a stunning administration. These factors enabled the Egyptians to survive while other cultures and nations withered and died ... Throughout history Egyptians have felt that their mission is to tend to life. They were proud to turn the land green, to make it blossom with life. The other thing is that Egyptians invented morality long before the major religions appeared on earth. Morality is not just a system for control but a protection against chaos and death ... Egypt gave Islam a new voice. It didn't change the basic tenets of Islam, but its cultural weight gave Islam a new voice, one it didn't have back in Arabia. Egypt embraced an Islam that was moderate, tolerant and non-extremist. Egyptians are very pious, but they know how to mix piety with joy, just as their ancestors did centuries ago. Egyptians celebrate religious occasions with flair. For them, religious festivals and the month of Ramadan are occasions to celebrate life. Increased involvement by King Farouk in parliamentary affairs, government corruption, and the widening gap between the country's rich and poor led to the eventual toppling of the monarchy and the dissolution of the parliament through a coup d'état by a group of army officers in 1952. 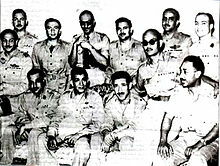 The Egyptian Republic was declared on June 18, 1953 with General Muhammad Naguib as the first President of the Republic. After Naguib was forced to resign in 1954 and later put under house arrest by Gamal Abdel Nasser, the real architect of the 1952 movement, mass protests by Egyptians erupted against the forced resignation of what became a popular symbol of the new regime. Nasser nationalized the Suez Canal leading to the 1956 Suez Crisis. Egypt became increasingly involved in regional affairs until three years after the 1967 Six-Day War, in which Egypt lost the Sinai to Israel, Nasser died and was succeeded by Anwar Sadat. Sadat revived an Egypt Above All orientation, switched Egypt's Cold War allegiance from the Soviet Union to the United States, expelling Soviet advisors in 1972, and launched the Infitah economic reform policy. Like his predecessor, he also clamped down on religious and leftist opposition alike. Hosni Mubarak was the president from 14 October 1981 to 11 February 2011, when he resigned under pressure of popular protest. Although power was ostensibly organized under a multi-party semi-presidential system, in practice it rested almost solely with the president. In late February 2005, for the first time since the 1952 coup d'état, the Egyptian people had an apparent chance to elect a leader from a list of various candidates, most prominently Ayman Nour. Most Egyptians were skeptical about the process of democratization and feared that power might ultimately be transferred to the president's first son, Gamal Mubarak. After the resignation of Hosni Mubarak presidential powers were transferred to the Supreme Council of the Armed Forces, who relinquished power on 30 June 2012 when Mohamed Morsi became the first democratically elected head of state in Egyptian history. He was ousted in a revolution a year after and is on trial. In the presidential elections on 26–28 May 2014, Abdel Fattah el-Sisi won in a landslide, capturing 22 million of the nearly 23 million votes counted. Today, Egyptians carry names that have Egyptian, Arabic, Turkish, and Greek origins (especially Coptic ones) among others. The concept of a surname is lacking in Egypt. Rather, Egyptians tend to carry their father's name as their first middle name, and stop at the 2nd or 3rd first name, which thus becomes one's surname. In this manner, surnames continuously change with generations, as first names of 4th or 5th generations get dropped. It is not entirely unusual for families of Egyptian origin (especially Coptic ones) to have names or family names beginning with the Egyptian masculine possessive pronoun pa (generally ba in Arabic, which lost the phoneme /p/ in the course of developing from Proto-Semitic). For example, Bayoumi (variations: Baioumi, Bayoumi, Baioumy) "of Fayyoum", Fayyoum meaning "of the big water (yom)", Basyouni (of Aswan), Bashandi, Bakhoum ("the eagle"), Bekhit, Bahur ("of Horus") and Banoub ("of Anubis"). The name Shenouda, which is very common among Copts, means "child of God". Hence, names and many toponyms may end with -nouda, -noudi or -nuti, which means Of God in Egyptian and Coptic. In addition, Egyptian families often derive their name from places in Egypt, such as Minyawi from Minya and Suyuti from Asyut; or from one of the local Sufi orders such as el-Shazli and el-Sawy. More examples of prominent surnames are Qozman and Habib. 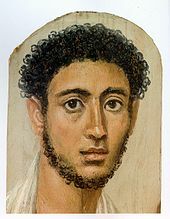 "Certainly there was some foreign admixture [in Egypt], but basically a homogeneous African population had lived in the Nile Valley from ancient to modern times... [the] Badarian people, who developed the earliest Predynastic Egyptian culture, already exhibited the mix of North African and Sub-Saharan physical traits that have typified Egyptians ever since (Hassan 1985; Yurco 1989; Trigger 1978; Keita 1990; Brace et al., this volume)... The peoples of Egypt, the Sudan, and much of East Africa, Ethiopia and Somalia are now generally regarded as a [Nile Valley] continuity, with widely ranging physical features (complexions light to dark, various hair and craniofacial types) but with powerful common cultural traits, including cattle pastoralist traditions (Trigger 1978; Bard, Snowden, this volume). Language research suggests that this Saharan-[Nile Valley] population became speakers of the Afro-Asiatic languages... Semitic was evidently spoken by Saharans who crossed the Red Sea into Arabia and became ancestors of the Semitic speakers there, possibly around 7000 BC... In summary we may say that Egypt was a distinct Afro-Asiatic African culture rooted in the Nile Valley and on the Sahara." ^ a b "مصر في المركز الـ13 عالميا في التعداد السكاني". BBC News Arabic. 2017-09-30. Retrieved 2018-09-01. ^ a b والاحصاء, الجهاز المركزى للتعبئة العامة. "الجهاز المركزى للتعبئة العامة والاحصاء". msrintranet.capmas.gov.eg. Retrieved 2016-07-20. ^ a b c d e f g h i j "9.5 million Egyptians live abroad, mostly in Saudi Arabia and Jordan". Egypt Independent. 1 October 2017. Retrieved 3 January 2018. ^ Wahba, Jackline. A Study of Egyptian Return Migrants. February 2011. ^ a b c d CAPMAS. "تسع ملايين و 471 ألف مصري مقيم بالخارج في نهاية 2016" (PDF) (in Arabic). Retrieved 4 January 2018. ^ "Jews, by Country of Origin and Age". Statistical Abstract of Israel (in English and Hebrew). Israel Central Bureau of Statistics. 26 September 2011. Retrieved 31 July 2016. ^ National Geographic Geno 2.0 Project - Egypt, Egypt= 71% North and East African. As ancient populations first migrated from Africa, they passed first through northeast Africa to southwest Asia. The Northern Africa and Arabian components in Egypt are representative of that ancient migratory route, as well as later migrations from the Fertile Crescent back into Africa with the spread of agriculture over the past 10,000 years, and migrations in the seventh century with the spread of Islam from the Arabian Peninsula. The East African component likely reflects localized movement up the navigable Nile River, while the Southern Europe and Asia Minor components reflect the geographic and historical role of Egypt as a historical player in the economic and cultural growth across the Mediterranean region. ^ C. Petry. "Copts in Late Medieval Egypt." 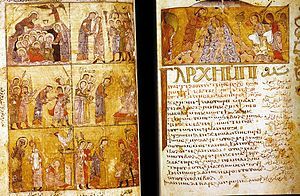 Coptic Encyclopaedia. 2:618 (1991). ^ Lane, Edward William. An Account of the Manners and Customs of the Modern Egyptians. Cairo: American University in Cairo, 2003. Rep. of 5th ed, 1860. pp. 26–27. ^ "Egypt's Sisi meets world Evangelical churches delegation in Cairo". Al-Ahram Weekly. Retrieved 2018-04-26. ^ Egypt. The CIA World Factbook. 2006. ^ "Migration And Development In Egypt" (PDF). Archived from the original (PDF) on 2016-05-01. Retrieved 2017-10-28. ^ Wakin, Edward. A Lonely Minority. The Modern Story of Egypt's Copts. New York: William, Morrow & Company, 1963. pp. 30–31, 37. ^ a b Talani, Leila S. Out of Egypt. University of California, Los Angeles. 2005. ^ Mitchell, Josh. "Egyptians came for jobs, then built lives". Archived from the original on August 19, 2006. Retrieved 2008-04-13. CS1 maint: BOT: original-url status unknown (link). Baltimore Sun. August 13, 2006. ^ Evans, Brian. Plight of Foreign Workers in Saudi Arabia. ^ Rod Nordland (2008). "The Last Egyptian Belly Dancer". Newsweek. Retrieved 2008-06-02. ^ a b Hinnesbusch, p. 93. ^ Deighton, H. S. "The Arab Middle East and the Modern World", International Affairs, vol. xxii, no. 4 (October 1946), p. 519. ^ "Before Nasser, Egypt, which had been ruled by Britain since 1882, was more in favor of territorial, Egyptian nationalism and distant from the pan-Arab ideology. Egyptians generally did not identify themselves as Arabs, and it is revealing that when the Egyptian nationalist leader [Saad Zaghlul] met the Arab delegates at Versailles in 1918, he insisted that their struggles for statehood were not connected, claiming that the problem of Egypt was an Egyptian problem and not an Arab one." Makropoulou, Ifigenia. Pan – Arabism: What Destroyed the Ideology of Arab Nationalism?. Hellenic Center for European Studies. January 15, 2007. ^ a b Hinnesbusch, p. 94. ^ a b Barakat, p. 4. ^ a b Barakat, p. 5. ^ "Arab Invasions: The First Islamic Empire | History Today". www.historytoday.com. Retrieved 2018-03-17. ^ qtd. in Alan K. Bowman Egypt after the Pharaohs, 332 BC − AD 642. Berkeley: University of California Press, 1996. p. 126. ^ Dobon, Begoña; Hassan, Hisham Y.; Laayouni, Hafid; Luisi, Pierre; Ricaño-Ponce, Isis; Zhernakova, Alexandra; Wijmenga, Cisca; Tahir, Hanan; Comas, David; Netea, Mihai G.; Bertranpetit, Jaume (28 May 2015). "The genetics of East African populations: a Nilo-Saharan component in the African genetic landscape". Scientific Reports. 5 (1). doi:10.1038/srep09996. ^ Salmawy, Mohamed. 'Dialogues of Naguib Mahfouz: Mon Egypte' Archived 2006-10-02 at the Wayback Machine. Al-Ahram Weekly. 10–16 August 2006. ^ Watterson, p. 294. Books.google.ch. Retrieved 2012-09-06. ^ Batrawi A (1945). The racial history of Egypt and Nubia, Pat I. J Roy Anthropol Inst 75:81–102. ^ Batrawi A. 1946. The racial history of Egypt and Nubia, Part II. J Roy Anthropol Inst 76:131–156. ^ Keita, SOY (1990). "Studies of ancient crania from northern Africa". Am J Phys Anthropol. 83 (1): 35–48. doi:10.1002/ajpa.1330830105. PMID 2221029. ^ Keita, SOY (1992). "Further studies of crania from ancient northern Africa: an analysis of crania from First Dynasty Egyptian tombs". Am J Phys Anthropol. 87 (3): 245–254. doi:10.1002/ajpa.1330870302. PMID 1562056. ^ Berry AC, Berry RJ, Ucko PJ (1967). "Genetical change in ancient Egypt". Man. 2 (4): 551–568. doi:10.2307/2799339. JSTOR 2799339. ^ Brace CL, Tracer DP, Yaroch LA, Robb J, Brandt K, Nelson AR (1993). "Clines and clusters versus "race:" a test in ancient Egypt and the case of a death on the Nile". Yearbook of Physical Anthropology. 36: 1–31. doi:10.1002/ajpa.1330360603. ^ Irish JD (2006). "Who were the ancient Egyptians? Dental affinities among Neolithic through postdynastic peoples". Am J Phys Anthropol. 129 (4): 529–43. doi:10.1002/ajpa.20261. PMID 16331657. ^ Brace, C. L.; Tracer, D. P.; Yaroch, L. A.; Robb, J.; Brandt, K.; Nelson, A. R. (1993). "Clines and clusters versus "Race:" a test in ancient Egypt and the case of a death on the Nile". American Journal of Physical Anthropology. 36: 1. doi:10.1002/ajpa.1330360603. ^ Arredi B, Poloni E, Paracchini S, Zerjal T, Fathallah D, Makrelouf M, Pascali V, Novelletto A, Tyler-Smith C (2004). "A Predominantly Neolithic Origin for Y-Chromosomal DNA Variation in North Africa". Am J Hum Genet. 75 (2): 338–45. doi:10.1086/423147. PMC 1216069. PMID 15202071. ^ Manni F, Leonardi P, Barakat A, Rouba H, Heyer E, Klintschar M, McElreavey K, Quintana-Murci L (2002). "Y-chromosome analysis in Egypt suggests a genetic regional continuity in Northeastern Africa". Hum Biol. 74 (5): 645–58. doi:10.1353/hub.2002.0054. PMID 12495079. ^ Yurco, Frank (Sep–Oct 1989). "Were the Ancient Egyptians Black or White?". BAR Magazine. 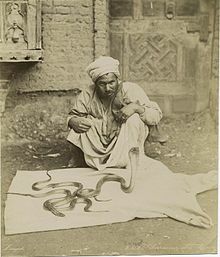 Wikimedia Commons has media related to People of Egypt.